By Scott Gilfoid: WBA lightweight champion Brandon Rios (28-0-1, 21 KO’s) will be defending his World Boxing Association title for the second time on December 3rd against John Murray (31-1, 18 KO’s) in what promises to be an easy title defense at the Madison Square Garden, New York, New York. I can’t think of an easier fight for Rios in the top 15 than feeding Murray to him. Rios, 25, wanted to fight Kevin Mitchell but had to settle for Murray when he couldn’t make it to the U.S due to legal issues. This leaves the guy that Mitchell beat recently in the #15 IBF ranked Murray. I think Murray is really kidding himself. 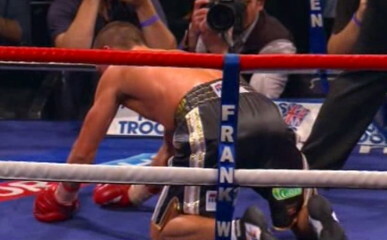 Rios is a perfect nightmare for Murray, but that’s about in terms of having the perfect style. Murray lacks the hand speed, defensive ability and overall talent to hang for long against a puncher like Rios. I expect this fight to be over by the 1st round. If Urabano Antillon could only last three rounds with Rios, then Murray will probably make it little more than a round at best. You see Murray is a plodder type of fighter that leads with his face, and that’s the worst kind of opponent to be put in with a murderous puncher with the power that Rios has got.